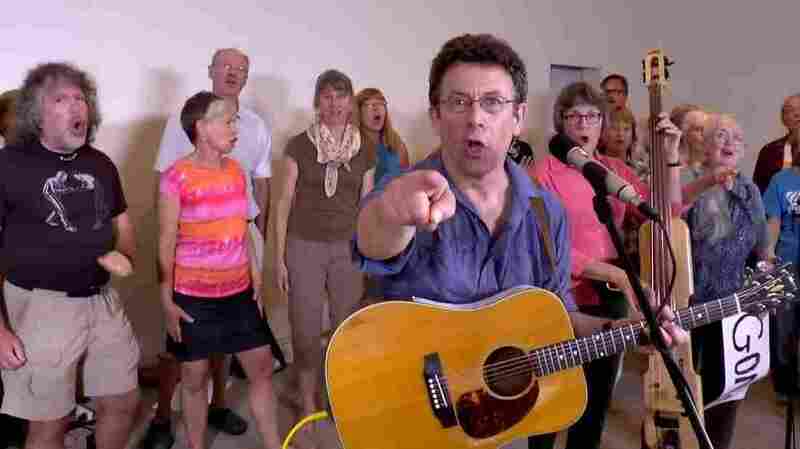 Scientist Who Wrote Protest Song About Canada's PM Is Put On Leave : The Two-Way Tony Turner wrote and sang "Harperman," leading a (barefooted) choir through lyrics that ask questions such as "Who squashes all dissent?" and "Who muzzles all the scientists?" Both the song and its video fit many people's idea of Canada: clever and smiling. But the man who wrote lyrics telling Canadian Prime Minister Stephen Harper, "It's time for you to go," has been put on leave from his job as a federal scientist at Canada's environmental agency. Tony Turner wrote and performed the song "Harperman," leading a (barefooted) choir known as the Crowd of Well Wishers through lyrics that ask questions such as "Who squashes all dissent?" and "Who muzzles all the scientists?" A physical scientist and folksinger who lives in Ottawa, Turner is still being paid while the government looks into whether his folky tune, "Harperman," represents a breach of the ethics code, according to his union, the Professional Institute of the Public Service of Canada. He was placed on leave this week. The union's president, Debi Daviau, tells the CBC that Environment Canada is alleging that Turner "violated the departmental code of values and ethics in that the writing and performing of this song somehow impeded his ability to impartially study migratory birds." The song has been on YouTube since June, but it's rising to new prominence as Canada's elections loom in October. It now has more than 60,000 views. Turner and his allies are organizing a sing-along of "Harperman," to be held next month. Tony Turner, a physical scientist and folksinger who lives in Ottawa, is on paid leave while Canada's environmental agency determines whether he broke the agency's ethics code. Since news of Turner's suspension from work spread, the hashtag #Harperman has been trending on Twitter in Canada. In one tweet, the title was placed over an image of Harper as the Joker. In another, the choir was compared to the dissident Russian band Pussyriot. Turner leads the song on acoustic guitar, backed by a spirited choir whose members include several ladies in colorful straw hats. In the song's credits, Turner is identified only as an "Ottawa folksinger." At one point, a man asks, "Who's a two-bit controlling freak?" – a line that was echoed in the Canadian press this week, when a senator who was expelled from Harper's Conservative party caucus called the prime minister a "control freak." "When you contradict, shame or make the PM look bad regardless of its significance, watch out because some of his soldiers are coming after you." Brazeau, we'll note, is on trial for assault and sexual assault; he was kicked out of the Conservative caucus after his arrest on those charges in 2013. As for Turner, the CBC notes that after working for the government for nearly 20 years, he had been planning to retire this fall.